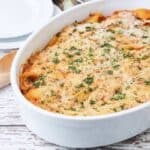 With pasta, fire roasted tomatoes, herbs, and a creamy cheese sauce, you won’t even miss the meat in this Tomato Casserole Recipe! It is a perfect, comforting Meatless Casserole option for the whole family. 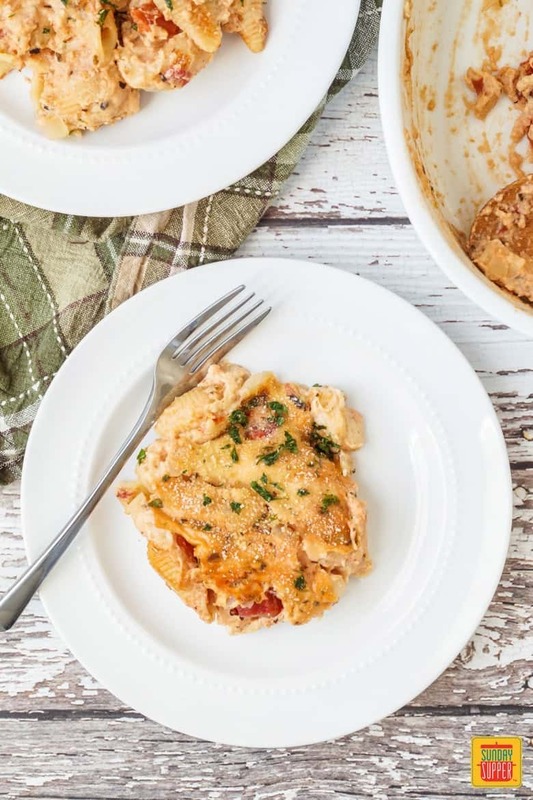 This Tomato Casserole Recipe, originally from Bobbi’s Kozy Kitchen, is the ultimate comfort food for all ages. This dish comes together fairly easily. In one pot, create a roux with evaporated milk as the base for the shredded Mozzarella and Parmesan cheeses. In a second pot, soften the onions with the fire roasted tomatoes and spices. Mix yogurt with the evaporated milk and cheese for an even creamier texture. Fold both mixtures together with the pasta and transfer to a favorite casserole dish. This Tomato Casserole Recipe is topped with an even layer of seasoned breadcrumbs and baked until everything is golden and bubbly. Enjoy the Tomato Casserole as a main dish paired with a salad or even as a side. 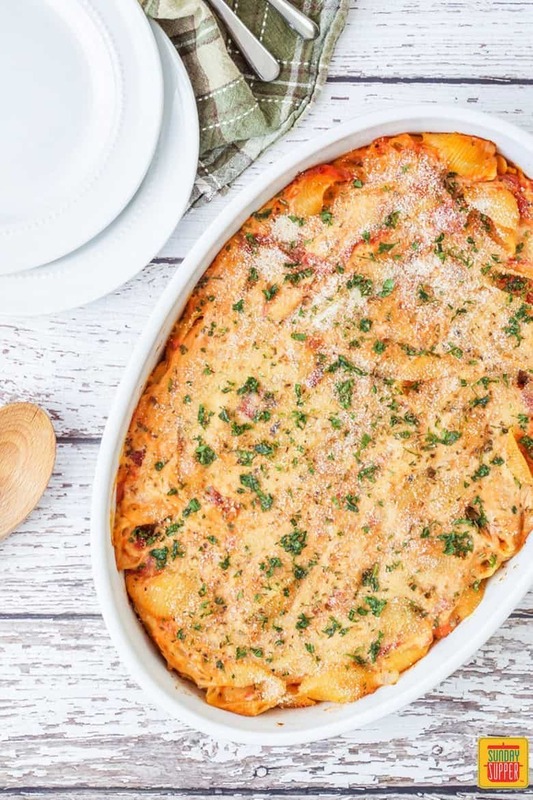 Along with the cheese, this meatless casserole has lots of onions and tomatoes which makes me feel slightly more healthy while indulging at the same time. It definitely hit the spot with the chilly weather lately. Be careful to not overcook the pasta while boiling and drain as soon as they become nearly al dente. They will cook a little further while baking in the oven. Crush the dried oregano and basil between your fingers before adding to the tomato mixture. This will help release additional flavor. I tend to only keep unseasoned breadcrumbs in the pantry. To season them yourself, take about two cups of unseasoned breadcrumbs and mix in about 1 tablespoon of Italian seasonings and large pinches of salt, garlic powder, and onion powder. In addition to folding it into the sauce, I also sprinkled some of the freshly chopped parsley over the breadcrumb-topped casserole for extra color. If you are looking for an even richer and more creamy casserole, use the full fat versions of the evaporated milk and Greek yogurt. Looking for more comforting Meatless Casseroles? Try Swedish Creamy Potato Casserole (Jansson’s Frestelse), Chickpea Curry Enchilada Casserole, Strawberries and Cream French Toast Casserole, and Trinidad Macaroni Pie. 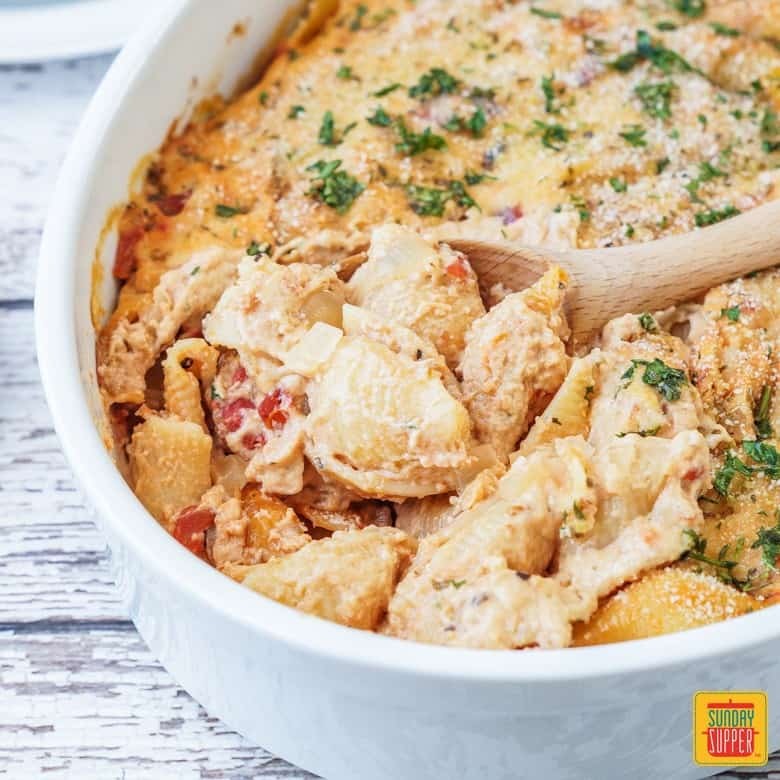 With pasta, fire roasted tomatoes, herbs, and a creamy cheese sauce, you won't even miss the meat in this Tomato Casserole Recipe! It is a perfect, comforting Meatless Casserole option for the whole family. Bring a large pot of salted water to a boil. Add the dried pasta shells and cook until barely tender. It will cook further in the oven. Drain and set aside. In a medium pot, melt the butter over medium heat. Add the garlic and cook until just fragrant, 30 seconds to 1 minute. Whisk in the flour until it forms a pasta and develops a nutty aroma, 2-4 minutes. While continuing to whisk, slowly pour in the evaporated milk. Continue to whisk until the mixture thickens, about 5 minutes. Remove from heat. If the mixture was boiling, allow to rest for a minute before adding the mozzarella and Parmesan cheeses, 1 cup at a time and incorporating between each addition. Set aside. In a large skillet, drizzle the olive oil over medium high heat. Add the onion and cook, stirring occasionally, until softened and translucent, about 5 minutes. Add the tomatoes with the juice and cook until heated through. Stir in the oregano, basil, yogurt, parsley, salt, and pepper. Fold in the cooked pasta shells and the cheese mixture until well combined. Season with additional salt and pepper if needed. Transfer the mixture to a casserole dish and sprinkle evenly with breadcrumbs. Drizzle with additional olive oil and bake until golden and bubbly, about 30 minutes.